Worried by the increase in number of out-of-school children in Northern Nigeria, TY Danjuma in collaboration with All Children Charity International Foundation (ACCIF) have identified 120 of such girls and enrolled them back to the classroom. 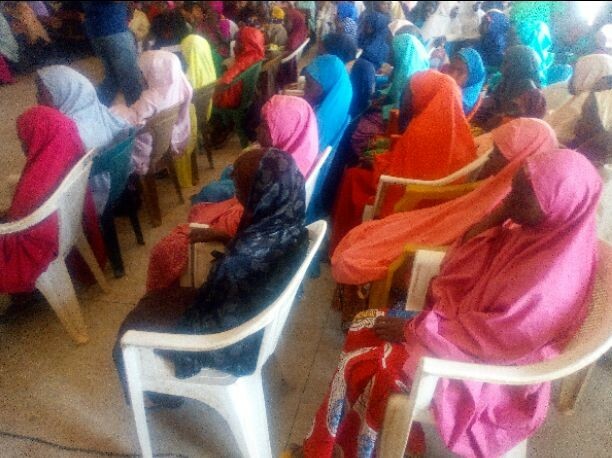 They are identified girl-child that cut across three villages include Marke, Nassarawan Doya and Makarfi communities all within Makarfi local government area of Kaduna State. Nigeria has well over 10.5 million out of school children who are not in school. Of course, girls form the largest body of this figure due to poverty, armful cultural practices, lack of access to school, insecurity and what have. Non-governmental organisations like TY Danjuma Foundation, ACCIF, UNFPA, Development Communications among others have been implementing one programme or the other to reduce the trend especially in northern Nigeria where this challenge seems to be on the high side. In Makarfi, the Acting District Head Makarfi, Bello Muhammed Sada, represented at the commissioning of the project on Thursday by Village Head, Maraban Makarfi, Munir Muhammed Makarfi, thanked the sponsors and promised to ensure the success of the programme. “We thank these people for what they have brought to our girls in this area. I promise that we will motivate and mobilise parents to give maximum support to ensure our daughters acquire education especially the beneficiaries of this project. “Before now, poverty is partly responsible for school drop out and even out of school. But I believe this development will spur the parents to send their children to school”, he added. Commissioner, Ministry of Education, Science and Technology, Jafaru Sanu who was represented by Director in charge of Female Education, Esther Kayock thanked the partners for the gesture saying, it would help in solving educational issues especially as it affect girl-child in the state. The commissioner however called on the beneficiaries to make judicious use of the opportunity provided by the non-governmental organisations urging them to be good ambassador and attend their class regularly. Earlier, Team Leader, ACCIF, Barr Paul Daudu said, the enrolment and retention and completion of secondary school education for the 120 identified girls became necessary in order to make them more useful to themselves and the society. According to him, the project in addition to the enrolment would engage the School Based Management Committees (SBMCs) and Parent Teachers Association (PTA) and the community education stakeholders in identifying and profiling families with girls not attending or missing out of school in the three project locations. He added that, the project would also gather a comprehensive data of number of girl-child not attending or who are at the risk of dropping out of school across the mapped locations among others. “Today, 120 girl-child who are missing out of school have been identified and they will b e enrolled back to the classroom. “The girls will be provided with necessary learning materials such as text books, note books, writing materials, school bags, school sandals, socks, uniforms, mathematical sets among others. “The project has made school learning desk available which will be donated to the schools where the girls will be enrolled”, Paul added. The project, which was commissioned at Junior Secondary School (JSS), Makarfi has 51 students in JSS One, 29 in JSS Two, 8 in JSS 3, 25 in Senior Secondary School (SSS) One and 7 in SS Two.